Our six finalist are set with the three USASA Cup regional finals a week away. On Sunday, 21 June, the Ukrainian American Sports Center in Horsham, Pennsylvania will host the title matches to determine the Region I Champions for the Werner Fricker USASA Open Cup, the Gerhard Mengel USASA Over-30 Cup and the USASA Amateur Cup. The winners will advance to the USASA National Cup Finals that will be played at the Virginia Beach Sportsplex Stadium in Virginia Beach, Virginia between 16 to 18 July. 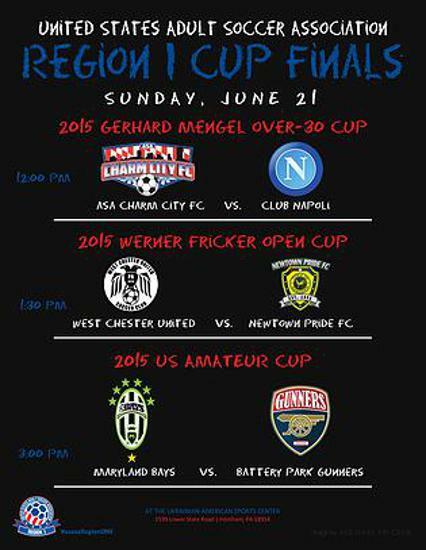 The Gerhard Mengel USASA Over-30 Cup will be played at noon and features ASA Charm City O-30 of Maryland against Club Napoli of Connecticut. Charm City made its way to the final defeating United SC of Metro DC/Virginia 2:1. On a very hot May day that left both sides with tired legs, Rob Layton gave Charm City the halftime lead when he took a pass from Tony Taminini and placed it in the upper right corner in the 31st minute. United came on strong in the second half and evened the score three minutes in. Darren LaRocque headed in the game winner in the 82nd from a headed flick from Kevin Mezzadra. Their opponent Club Napoli outlasted New York Greek American 4:3 to reach the final. The two teams that will play in the Werner Fricker USASA Open Cup were decided in mid-May. West Chester Majors of Eastern Pennsylvania will be the local side at the finals where they will meet against Newtown Pride FC of Connecticut. Normally an away match for West Chester, they hope to have their supporters give them home field advantage at the "Ukies" grounds for the 1:30 match. The final championship game set for 3:00 will see the Maryland Bays of Maryland and Battery Park Gunners of Massachusetts duke it out for the USASA Amateur Cup. The Gunners had to go at it twice on their journey to the regional finals as their first semifinal against Polonia Falcon of Connecticut was not completed due to inclement weather. The replay took place last Sunday with Battery Park shuting out Polonia 3:0. The Bays beat Jersey Shore Boca of New Jersey 5:1 with a brace from Dan Baxter and goals from Chris Ports, Pete Caringi and Collin Rome. Some of these teams started cup qualifying last September through their state associations. Region I had more than 100 teams from across 10 state associations competing for these three cups. Next week we will find out who will be the last three to make it to Virginia Beach. Stay up to date with all of our cup play by checking the tabs above for schedules and results.